We have a mini farm with about 200 animals. Goats, chickens, ducks, rabbits, Great Pyreenes dogs, cats, & 3 kiddos. We have this minifarm because, as a vegetarian and vegan for over 30 years, I am unable to support an industry that locks an animal in a box or cuts their beaks off to prevent pecking others because the animal is well…going crazy due to confinement & a humans need for more. I find it cruel. There are also only a few companies I trust to have ethically and humanly raised meat that’s GMO free. 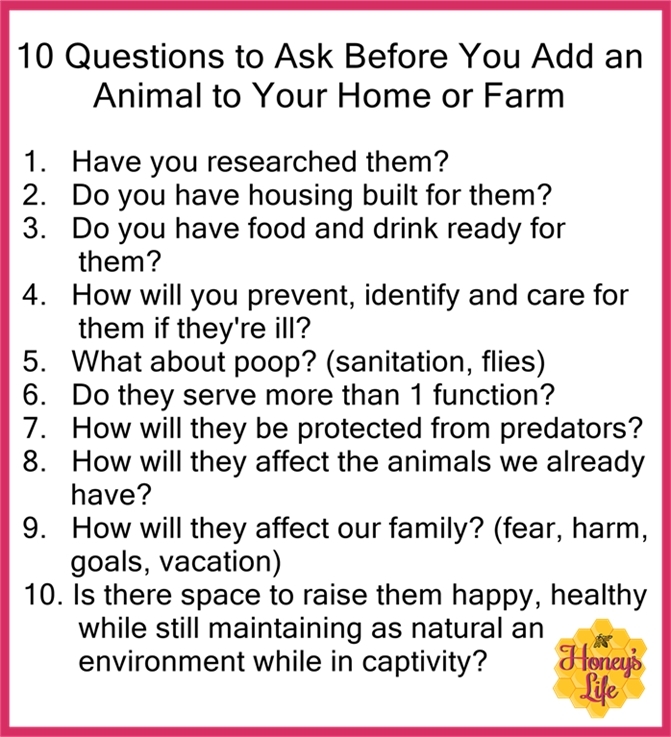 These questions are what must be answered and what the kids must share with us in order to purchase an animal. They also must to create a presentation to share the answers to the 10 questions. I made a printable with the quesitons and a ‘mini contract’ I and Ben and the kiddo must sign. I’ve even started adding a due by date if they’re wanting to have the animal this year unless they’re willing to assist with the money. We budget for everything otherwise we’ll have nothing. If you’d like a copy of the farm printables you can find it at the end of the post. These are the 10 Questions…. Do you have housing built for them? Do you have food and drink ready for them? How will you prevent, identify and care for them if they’re ill? Do they serve more than 1 function? How will they affect the animals we already have? Is there space to raise them happy, healthy while still maintaining as natural an environment while in captivity? I’m linking up with some other greenies, gardeners, homesteaders, and crunchy &/or chewy mommas n poppas!